Harold Allen's manager at single-A Osceola in 1989 had good things to say about the young pitcher, according to The Orlando Sentinel. Manager Rick Sweet called the left-hander from Indiana State University, a competitor. "I've always liked to see pitchers go after people like Harold does," Sweet told The Sentinel that July. "He has an awful lot of attributes - good work habits, an idea of what he wants to do, things everyone needs to get to the big league." Allen used his work habits and attributes in a career that saw time in six pro seasons. He ultimately made AAA, but he never made the majors. Allen's career began in 1987, taken by the Astros in the fifth round of the draft out of Indiana State. At Indiana State, Allen helped his team to the 1986 College World Series. The school inducted Allen and the rest of the squad into the university Athletics Hall of Fame. With the Astros, Allen started at short-season Auburn. He started 14 games, going 2-8, with a 4.72 ERA. He moved to single-A Asheville for 1988, improving to 11-8, with a 2.83 mark. At Osceola in 1989, he went 12-11. Allen made AA Columbus in 1990. 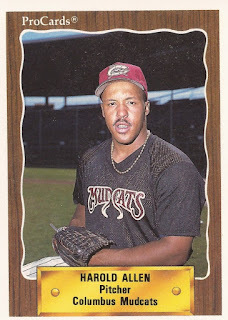 He spent the season there, getting 22 starts for the Mudcats and making the Southern League All-Star game. Overall, he turned in a 3.71 ERA and a 7-9 record. He played 1991 between AA Jackson and AAA Tucson. His AAA time amounted to five outings, four starts, and went poorly. Allen gave up 26 earned runs for Tucson in just 12 innings of work. Allen's final season with the Astros and in affiliated ball came in 1992 at Jackson. He went 6-12, with a 3.97 ERA. After not being recorded as playing in 1993 or 1994, Allen returned to the field in 1995 with the independent Rio Grande Valley WhiteWings. He got into 11 games there in 1995 and nine more in 1996, rounding out his career. Allen's connection with Rio Grande Valley appears to have extended a few years and he made an impression. University of Texas Rio Grande Valley pitcher Guadalupe Barrera cited Allen as an influential figure in his development. "I have had several," Barrera told the university's sports site. 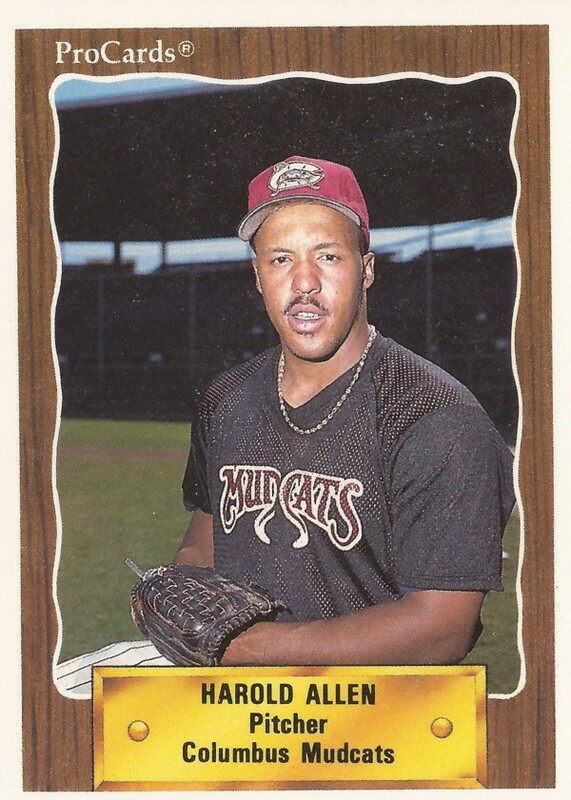 "Harold Allen, who played in the Houston Astros organization, came down to the Valley when I was nine. He was the one who first thought that I could make it past a certain level."